With 9 years of experience already in the industry, Gerard Kenny decided to formalize his training and graduated from the Culinary Institute of America in Hyde Park in 2011 before completing a rigorous culinary apprenticeship at The Greenbrier. Through his training, Gerard learned discipline and technique through traditional French cuisine. He was awarded 8 nationally recognized medals during his apprenticeship, of which he is one of less than 350 to graduate since the program’s inception in 1957. 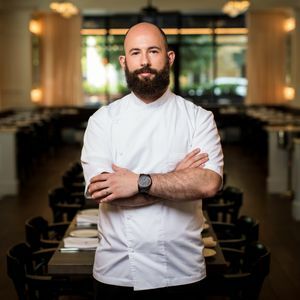 From there, Gerard moved to his wife’s home state of Texas, where he accepted the position as Sous Chef at the Inn at Dos Brisas in Houston, a luxury ranch resort focused on farm-to-table dining. He then served as Chef de Partie at Houston’s Four Seasons Hotel & Resorts in 2014. In March 2015, Gerard joined the New Waterloo team as a sous chef at La Condesa. Under the guidance of Executive Chef Rick Lopez, Gerard (better known as G!) became ingrained in Austin’s culinary scene and was promoted to Executive Sous Chef in 2017. After three formative years at La Condesa, Gerard was named Executive Chef of Le Politique in June 2018. At the helm of the brasserie, he returns to his fundamentals and training in classic French cuisine.